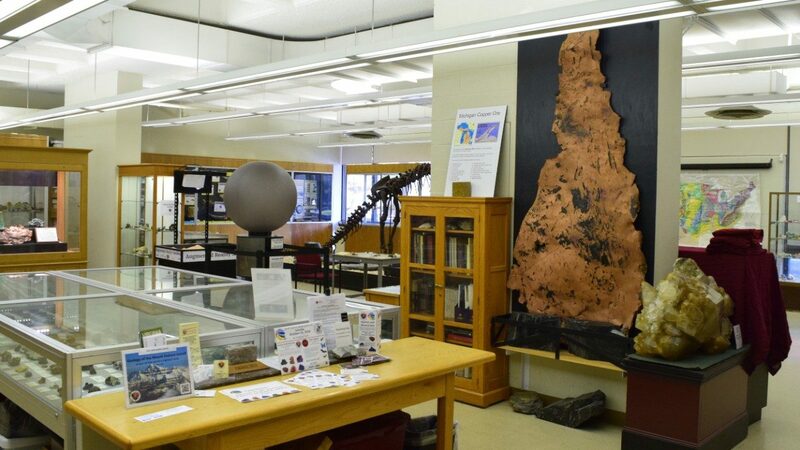 The Museum of Geosciences is housed in the VT Department of Geosciences and located in 2062 Derring Hall. Exhibits include the OmniGlobe, gems, minerals, rocks, fossils, and a full-scale cast of an Allosaurus dinosaur skeleton. 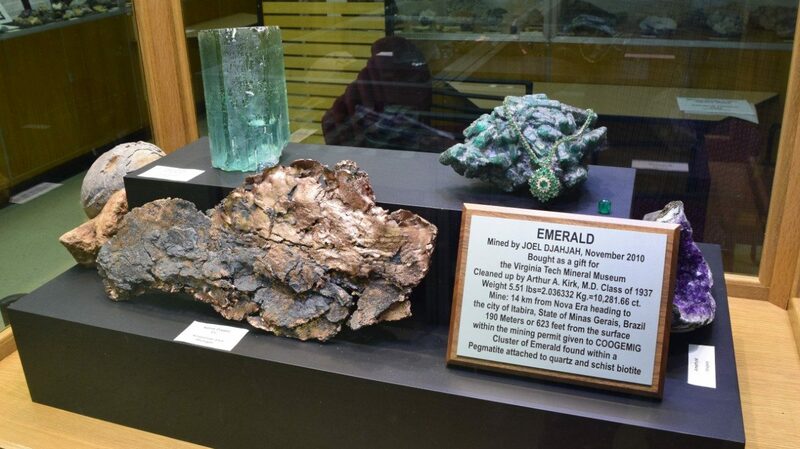 The minerals and fossils on display include many specimens from Virginia and famous localities worldwide. The OmniGlobe can project global datasets, such as weather and plate tectonics, on a sphere. Public hours are 8:00am-5:00pm, Monday-Friday during spring and fall academic semesters. Children should be accompanied by an adult. Please see the Visiting page for reservations, tour leaders, parking, or more information. In Spring 2019 there is a new course offered in the Museum -- Natural History Collections & Curation! We also have Public Lectures, our usual school group visits, Kindergarten-to-College 5th grade campus expeditions, recognition of Darwin Day and Earth Day, an Alumni Open House, and other activities our students invent. Follow @hokiesaurus on twitter for quick reminders! K2C brings over 1200 5th graders and 220 teachers from all over Virginia to campus to explore college and encourage learning. They visit activities in small groups of 10-20. 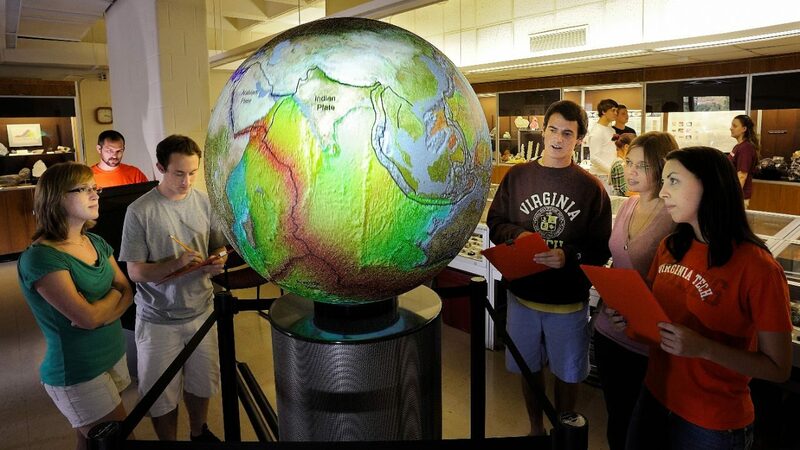 The Museum of Geosciences is always a favorite because of our enthusiastic Geosciences student hosts. Coastal Detectives: reading the clues from earthquakes and tsunamis in coastal deposits. Dr. Tina Dura, VT Geosciences. RESCHEDULED to Thursday, April 18, 2019, 7:00-8:30 pm in Derring Hall. Lecture 7:00-8:00 pm in room 4069 Derring, followed by a meet-the-scientists reception from 8:00-8:30 in the Museum, 2062 Derring. Hokiesaurus Presents: Where does our water come from? Youth program for upper elementary age (10-12 years old). Free. Kids must have an accompanying adult. Please pre-register with Erin Kelly at erink25@vt.edu, limit 12 kids. Many families in Montgomery County have wells, while others get their water from the New River. We will explore drinking water resources using hands-on models of aquifers and surface waters. Hokiesaurus Presents.... is a series of youth programs developed by students in the Department of Geosciences. Dates and topics TBD. Research a la Mode is a seminar series by grad students for grad students to practice communicating science. Dates and topics TBD.